...is not like the others! Growing up I had one of these books. 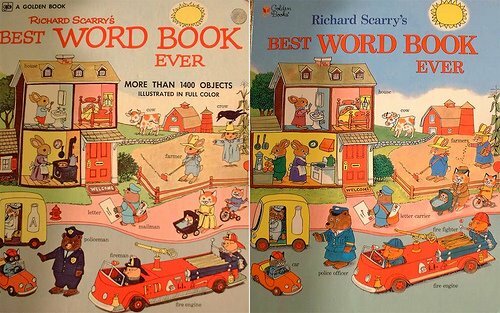 "Richard Scarry's Best Word Book Ever". Kokogiak posted a looksie on Flicker that shows how the 1991 edition differs from the 1963 original. It is a fun romp through political correctness and modernization. I believe mom even made a hand-stitched Lowley Worm plushie for my brother. Hint, assuming your browser is properly configured, you should be able to hover your cursor over his pictures and highlight the changes. Don't expect anyone but die-hard manga and anime freaks like us to get this one, but a very creative individual posted a flash movie takeoff. They took the opening credits to Azumanga Diaoh anime series and rebuilt it for the Yotsuba&! manga characters. Very well done if you've familiar with either one. If you are using SAGE for your RSS feeds, you can customize the templates the feeds are displayed it. It isn't obvious from the extensions page. You need to go directly to the SAGE site. Check out the Styles link and follow the previews/instructions. I really like the dual-pane display, but am using the "Hicks" style sheet since the colors better match those I'm using in my Firefox browser (Outlook 2003 Blue). Paul Stamatiou outlines how to change the Firefox "throbber" button to link to any-other link of your choice. It seems so obvious now. Rumors on the net seem to suggest that next week, Mozilla will make a final release of Firefox 1.5 Right now they are sitting on RC3. I have been very happy with it. Only 3 crashes. I just wish my favorite extensions would catch up to this release for compatability. Songbird Media Player--coming soon. Found this while trolling the net. My very first thought was "Sheesh. Looks just like iTunes. Hope they don't get sued by Apple." Looking at it though, It could be a really nice media player/organizer for those who don't have iPods but want to manage Podcasts and such. Will have to keep an eye on it for now. In Firewall news--it looks like Symantec is about to kill off Sygate Firewall. Sygate recently got gobbled up by Symantec. They offered a free firewall for personal use. First we lost Kerio, now Sygate. Who next? I use ZoneAlarm and have since day one, but like to have alternatives to propose to individuals. My father-in-law's Win98 pc eventually refused to play nice with ZA so I switched it to Sygate since it was one of the last that supported Win98 OS. Speaking of firewalls...should you get a hardware firewall instead of using a software firewall? Or maybe use both? Since I am a pretty parinoid person when it comes to pc security, I have been considering dropping in a physical firewall/hub device between my cable router and pc. The benefit of a hardware firewall is that it provides an additional layer of protection for your network and is not OS linked, so if your system is compromised, it would (hopefully) not be and still provide some protection. I haven't made a final decision yet. One more article. I like lists. Here is a good one: Scott Hanselman's 2005 Ultimate Developer and Power Users Tool List. Some is freeware--much is not. Some is useful...much is for software developers. But it is a good list anyway. Opening up a can of malware spanking on gjhdumf.exe! Last week I had a real malware smackdown at work. Got an assignment to look at a user's pc that had a bad network client software upgrade. Got that fixed easy enough. (Good tip#1--know was MSGINA.DLL does and how to use it to your advantage!) So then I started doing the usual MS Automatic Update configuratations using the gpedit.msc tool running the malware scans/cleans (found a ton to clean). Then I downloaded and ran the latest MS AntiSpyware tool. As part of this whole thing, you have to agree to an ActiveX download to validate the OS first. So when I got an ActiveX popup, like the 1000's times before I just robotically clicked "OK" but in that horrible second after you do, I realized what I had read but not processed. That wasn't the MS ActiveX window (which popped up a second later). So I had to pull that first ActiveX out. What is going on? I paused and looked at the pc. Several popunder windows had appeard that I didn't notice. I reran all the malware scanner tools and the MS Antispyware. Clean. But I was still getting pop-unders. HiJackThis showed a clean registry as did SysInternals Autoruns. Hmmm. I ran CWShredder. Ok. Cleaned one more off. Rebooted. Everything looked clean after another full check. Browsed with IE and bam. More pop-unders. Checked the system processes but everthing there was normal. Hmmm. Rootkit? Possibly. So I rebooted and ran SystInternals FileMon and RegMon applications (concurrently). Then I fired up IE and started browsing. Soon enough I was getting pop-unders again. Once I was sure I got enough I closed IE and went back and examined the logs. Soon enough both showed that once IE was launched, a process/file called gjhdumf.exe was kicking off--calling to the registry, etc. I browsed to the location it was in C:\WINNT\system32 but didn't see it. Ah! I know what to do! I opened a command prompt session and did a dir gjh*. * And promptly found four "super-hidden" files! (I know that you can set the View Files opens in Windows Explorer" to show all these files, but from experience, some still don't always display except in DOS.) There was gjhdumf.exe along with gjdumf.dat, gjhdumf_navps.dat and one more I forgot to write down. I renamed all the files with an additional ".bad" extension and rebooted. Browsing once more in IE, no more pop-unders! I went back and deleted all those files. Ran a Rootkit Revealer scan. Nothing to see. Case closed. I usually save the files and examine them in PE unpackers but was too busy to take the time to save them. So how did the malware know to run only with IE and not be listed in the registry as startups? I can only guess that an additional registry hook had been placed in a such a way that tied into IE. So that when IE launched/ran it would trip over that extra registry call and fire up the malware file when then generated the pop-unders. Bonus link for you malware fighters--thanks paperghost! Japanese TV celeb Kaori Manabe was named "spyware extermination squad" leader in a Tokyo press event Thursday. Story here. Hoping your skies are clear! The photo comes courtesy of the City of Houston. I found a web-page on their site that rotates images of Houston. Some are pretty good. With a little work, they could be morphed into nice desktop images. PhotoFiltre: a complete image retouching program. It allows you to do simple or advanced adjustments to an image and apply a vast range of filters on it. Pixia: a powerful graphics editor with a unique user interface. When learning Pixia, it's easier to discard everything you know about Photoshop or Paintshop, and start from scratch with the tutorials and help files. FastStone Photo Resizer: Just resize me, ma'am! Let's you batch-process a series of image files including naming, cropping, and watermarking all in one pass. Great for bulk-management of images. FastStone Image Viewer: Use this small and fast image browsing tool to, view, edit and convert images. There are a ton of features and special effects you can apply to your images. Manage your desktop wallpapers and run a custom screensaver that pulls pictures from folders of your choice. It is fully packed and simple to use. Check it out! 0X Copy Machine combines your scanner and printer into a copying machine so that you can quickly make copies with just one mouse click without having to deal with scanning and printing as separate steps using disparate applications. Today is the last race of the NASCAR season. Getting chores done early so I can park on the couch and watch. Barring some horrible crash, I expect Tony Stewart to take the championship cup this season. I had planned to take the time today to set my blog up with Google Analytics. It is a new free service offered by Google that will provide web-stats of your site. It has some really cool features. When I first checked it out I was at work so I didn't want to set it up. Now when I checked today it is being restricted due to volume exceeding capacity so I have to wait again. I have finally cancelled our MSN dialup account. It was crazy. The (Indian?) call center guy was working through his boilerplate script trying to sell new services to me. I told him I wanted to cancel my dialup account so he asked the feedback question "Why?" Because I wanted broadband access and DSL wasn't available in my area. Only cable. Not a problem. Later in the script, he asked me if I would be interested in signing up for MSN DSL Broadband.....Sheesh. I told him that would have been nice but I had a different broadband provider since DSL broadband wasn't available in my area. He said not a problem. He would check and confirm that MSN DSL was actually available for me in my area. Ok. Fine. Five minutes later he confirmed for me that MSN DSL was not available in my area at this time, but would I like to keep MSN dial-up and sign up for notification when MSN DSL was available in my area. I politely explained that I had already done that TWO YEARS AGO and DSL still wasn't being extended to my area of the city (yes, I do live in the middle of a city). Geesh. Good news was that I was able to keep my old MSN email address active. Just got converted to Hotmail. So any stray emails that get sent to our old address will still be able to be picked up. One of the nice things about broadband is being able to fully subscribe to Podcasts. Basically, podcasts are audio files you download and play on your portable music player. I am a big fan of NPR and listen to over 2-3 hours of it daily commuting. So podcasts are kinda like listening to talk radio, but content that is highly focused. Right now I am downloading MuggleCast podcasts (on the world of Harry Potter). Quality runs the range from top notch to "is that the neighbor's kid?" There are lots of ways to get this content. Although you can manually download the files from websites (to play directly on your pc or mp3 player), having a dedicated file manager is a big plus. I use iTunes (or you can try Juice). You don't have to have a iPod to use it. Next find content by either browsing the iTunes Podcast site or use another website focused on podcast media like iPodder or PodNova. It can be a real source of news and entertainment. There are also some real "dogs" out there so it take some trial and error to find just what you are happy with. I'll try to keep you posted. Mozilla--the folks who bring us Firefox--are really hard at work. They recently released Firefox 1.5 RC3. It still isn't the final release version. The current release version is still 1.0.7 but I have been using 1.5 RC3 for a week and no problems at all. I really love the "in line" update feature. Before you had to completely reinstall the newer version. Now this just updates the components, not the entire thing. Many of the extensions are still not compatable, but more are being updated weekly. In better news, since MSN uses propriatary email server connections, you are stuck using Outlook Express as you email client. Now that I am with a different provider, I was able to finally switch over to using Thunderbird (from the Mozilla folks again). I am really loving it (1.5 RC1). It took me a little bit to set up and configure, but it is tops. It can also pluck mail out of my GMail accounts as well. It also supports custom themes and extensions like Firefox has. Lavie was a little unsure about switching, but she is very comfortable with it now. Next, I am going to get her to start using Sunbird, their calandaring tool. Speaking of extensions for Firefox, I have over 30 blogs I monitor almost daily. Checking each site for updates can be a real time-consuming process. I use the Firefox browser extension "SAGE". It lets me check the sites for updates at a glance. If you monitor a lot of sites as well, it can really help with your news/posting aggregation. It is RC 1.5 compatible. It you would prefer a "standalone" RSS aggregator, there are the Abilon and GreatNews RSS news feeders as well. Phil Leigh, analyst for Inside Digital Media, said the debacle shows just how reluctant the labels are to change their business model to reflect the distribution powers — good and bad — of the Internet. He believes that rather than adopting technological methods to try to stop unauthorized copying of music, record companies need to do more to remove the incentive for piracy. I completely agree with that. Lavie and I make the few purchases of CD's based on our likes (mostly now J-Pop and anime soundtracks). They are expensive $15-18. I wouldn't dare think about trying to download music from the internet. It isn't right or fair to the companies or artists. Not to mention a fear of the RIAA lawyers going after us like they have been in other cases like children, grandparents, etc... However, if I find a good cd and want to let my bro listen to it, I should be able to hand it over to him to enjoy without fear. We all like music. It is a part of our lives. Apple has started down a solution by offering downloads of individual songs for fair prices. If record companies would make ownership and fair use of music easier and cheaper, maybe we would buy more product. It is easy to forget the personal sacrifices that our nation's men and women (and their families) make when they enlist in the Armed Forces. 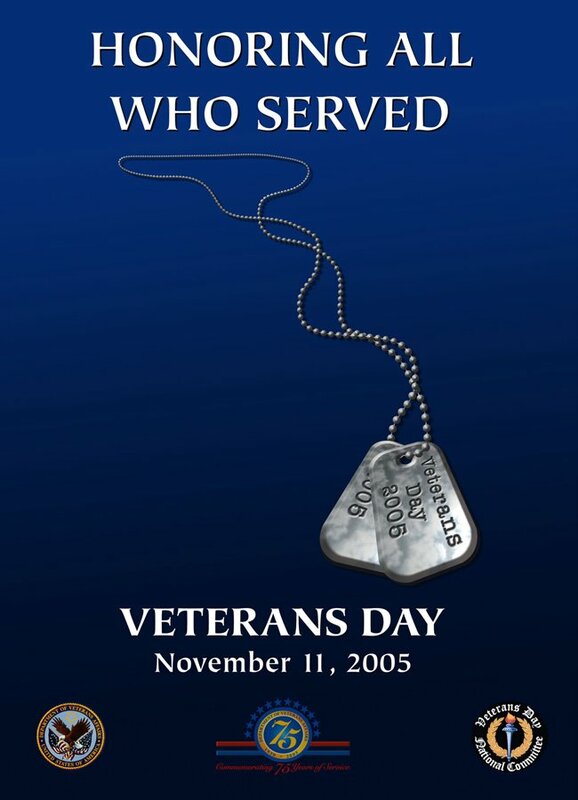 Take a minute to thank a Veteran. I am going to. 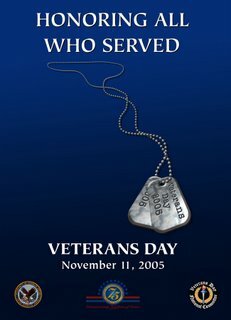 US Department of Veteran Affiairs -- Veterans Day Website. Thanking those who keep our skies free. Ok. Here we go again. I had spent two hours on this blog post this morning, then had a browser-crash and lost it all. Bummer. Let's see how fast I can do it this time. Saturday, the forces of Good and Evil were afoot. I woke up fine enough, but soon a headache came creeping in. That kinda took the wind out of my sails. I crawled back in bed and spent pretty much the entire day in bed. I have been doing lots of pc cleaning of malware/viruses this week at work so I really am (even now moreso) tired of computers. I'm going to do some quick items of interest on tech then quickly move on to more entertaining fare. Sony appears to be using a digital rights managment form of software that really is a rootkit. Mark Russinovik of Sysinternals seems to have found it about the same time as the F-Secure team. Basically a rootkit is software that runs under the radar of your system and most security tools. Because it does this, it is very hard to find and can control many aspects of your pc. If you tend to play a lot of Sony music CD's on your pc, you may want to run one of these free root-kit detectors (Rootkit Revealer or Blacklight). If you are a tech-wiz and want to manually remove it, have at it. Sony has issued a "service-pack" that unhides the rootkit files and software, but still leaves the application on your pc. Sony's exec. was interviewed by NPR on this and had the audacity to say that since most people didn't know what a rootkit was, they shouldn't be worried about it. In light of Sony's game, here is a freeware application for ripping/burning music: AudioGrabber. As mentioned earlier, I'm pretty burned out this weekend. It has been a long week of cleaning malware and viruses from workstations at work. I still stand by my prefered means of spyware removal using HiJackThis, Spybot Search and Destroy, AdAware and Microsoft Anti-Spyware. Between all these tool (and a lot of experience), most pc's can get cleaned of malware. (Sometimes you also need some special support tools to kill running processes and delete stubborn files.) Of course you need an anti-virus application to handle the virus/trojans. Microsoft's Malicious Software tool can remove some with an "online" scan. However, sometimes if you know specifically what you are dealing with, a more focused malware removal tool can save you some time. Speaking of Microsoft, they have recently announced the next version of their Anti-Spyware tool will be called Windows Defender. Dwight Silverman has good linkage on his TechBlog page. Here's my observation: Microsoft has taken a lot of heat (lawsuits) over embedding it's web-browser and media player technology in the Windows system builds. They have even offered stripped down versions just to play fair, though noone seems to be buying them. So when MS devivers its Vista system with this anti-malware software embedded, can we expect a new round of lawsuits from the anti-malware software vending community who are afraid of being squeezed out by MS, since many users may not be savvy enough to look elsewhere for this type of software (or even think they need it?) I will be watching this element very closely! Listening to right now: Japan-A-Radio. My favorite on-line music channel. 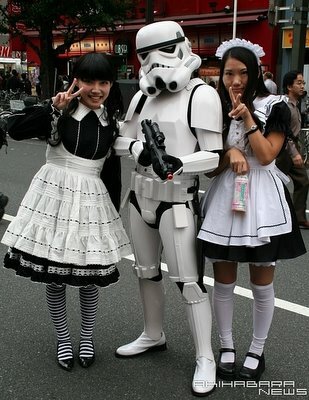 The photo above of the Stormtrooper flanked by the French Maids is courtesy of Akihabara News. So this guy bought a Stormtrooper costume and decided to capture the action as he walked the streets. Akihabara News also carries some of the latest electronic gadgets to come from Japan. Many of these are things that haven't yet hit the mainstream market yet. Really good site for gauging what is coming down the electronic supply chain. This LEGO Star Wars Battle cruiser is humongus. Totally radical. Completely custom built. Wow. For some more custom Star Wars LEGO action check out the FBTB.net site. Photos and all. Neat. These are all inspired by the LEGO Star Wars collection. There are tons of neat sets. LEGO's have come a long way since I was kid. For more fun, check out the time-lapse movie of a couple building a stock LEGO Star Destroyer model. Lavie and Alvis thought this was neat. Speaking of LEGO's, they have a free software download. It is called LEGO Digital Designer. You can run this software, design your own project (think LEGO-CAD). If you really like it, you can upload your design to LEGO and purchase it as a custom set with a custom box. Neat. Lavie and I really love the Ai Yori Aoshi manga. There is also an anime version of it we haven't seen yet (waiting to finish the manga series first). There now is a pc-game version of it and the publisher has a free trial version download available. It is worth it (to us) just for the intro montage. Ai Yori Aoshi can be translated into English as "True Blue Love." It reminds us of our dating days. Mando has a beautiful desktop image on his site. It is a photo of a Mesopotamian wall relief. Stunning. In the historical news category: Copernicus' grave has been uncovered in a Polish Church. Article. Tokyo life as seen from an (often humorous) Western perspective: www.tokyotimes.org. This guy has some good blog stuff! He's been added to my regular visit list. In response to my ponderings about how to handle a large number of bookmarks: Here is a long list of RSS feed ideas. (one of the last ones is titled "Ditch your Girlfriend"). Clever! Reading: My favorite anime magazine: NewType-USA. Promising anime series just out: Piano. Franktisek Straud has some INCREDIBLE photographic images from Japan. These are real "slice-of-life" shots. Really worth seeing the work of a photographer, regardless of your like for Japan. A metal detector enthusiast found a hoard of Tudor era coins in a field on the Isle of Man. Now showing at the Houston Museum of Natural Science: Diana, A Celebration. I've promised Lavie I would take her to this. She has been enthralled with Princess Diana since she was young. One of her favorite memories is when she and her dad woke up early one morning to watch the marriage of Lady Diana to Prince Charles on TV. It is a real shame to have lost such a special woman. She was making such a contribution to the world with attention given to AIDS research and landmine removals. Time to start wrapping things up. Masterpiece theatre is airing Kidnapped and I still have a few more loads of laundry to cycle through before it comes on! I come across a lot of humor on the web. Some is funny--most not so much. But as a student of history and tech, this had me falling out of the chair laughing. My sides hurt for a long time. Bad. (As found on Ed Bott's blog). I couldn't wait to my normal posting cycle to share. "If World War Two had been an online Real Time Strategy game, the chat room traffic would have gone something like this." Read the rest, I promise it's worth it. PS--WWII poster from here. Cool stuff.